Terrence Malick's central cinematic concern is the search for pure nature outside society, for humanity without it's inhumanity; but this is a search that he believes will always ultimately fail. There is no pure nature outside of humanity's corrupting influence. He developed this conflict through his study of Heideggar, whose idea that there is "no cosmic power, only action of hands upon the world" would profoundly influence his thinking. This theme that nature is fundamentally torn from itself is perhaps most clearly expressed in Edward Train's voice-over soliloquies of The Thin Red Line ("What's this war in the heart of nature? "), but it finds its simplest and most concise formation in Days of Heaven. 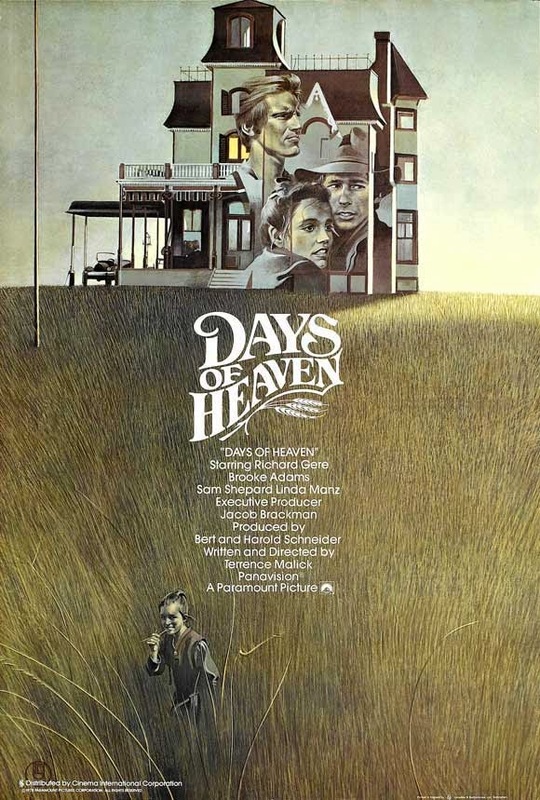 Here we have a small group who are themselves searching for a closer connection with nature (moving from the city to rural farmland), and through the form of the film Malick chases the same purity sought by his characters, knowing that he can never find it. The cinematography utilizes available lighting almost exclusively, but occasionally relies on artificial tricks (high wattage lights in the lamps and in the house) which, though visually seamless, structurally betray its naturalism. The editing cuts from the characters to natural representations of their emotions (a quivering leaf for nervousness, flying birds for fear, swimming beavers for innocence, etc. ), but always returns to the humanity it's bound by. And the arrival of the locusts and the burning of the wheat fields, its vision of nature's final destruction (at its own hands), is the most beautiful and most memorable image of the film. This "war in the heart of nature" reading also explains the images which I found most perplexing on my first viewing: the imposing shots of the farm's machinery. This provides both the counterpoint to nature (the artifice of man's own creation) as well as humanity's relationship with it (their means of harvesting, etc.). It also provides deeper meaning to the film's finale, where our protagonists are chased by the police (the ultimate symbol of society as opposed to nature).